After an EF-2 tornado ripped through the city of Shelby and surrounding communities on Sunday afternoon, families along Plymouth Springmill Road began taking stock of the damage and cleaning up on Monday. 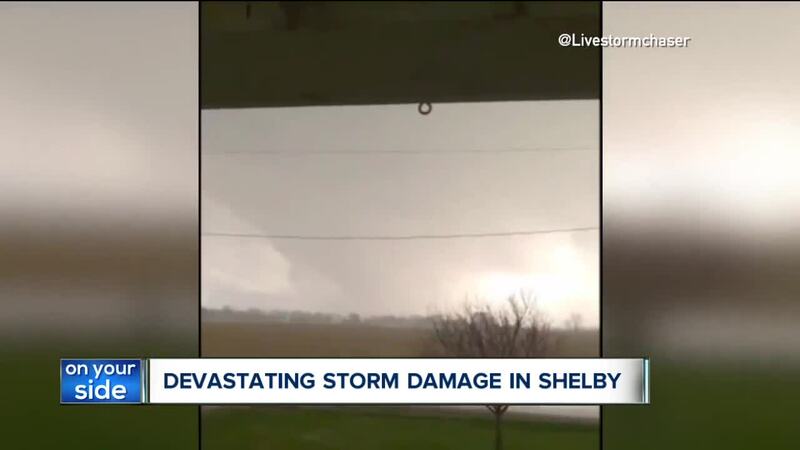 RICHLAND COUNTY, Ohio — After an EF-2 tornado ripped through the city of Shelby and surrounding communities on Sunday afternoon, families along Plymouth Springmill Road began taking stock of the damage and cleaning up on Monday. From the trees now uprooted in the yard to the slab of concrete that once formed the foundation for a garage, Brad and Emily Bowman’s property looked much different on Monday than it did 24 hours before. “It’s pretty scary knowing that I was standing in here a minute before it happened,” Brad Bowman said. Bowman said he had spent much of the day Sunday working in his garage, which he plans to turn into a weight room. When the tornado alert came across his phone, Bowman said he initially didn’t think anything of it. Then his wife Emily came out to tell him about the alert and they decided they needed to get inside with the kids and dogs. The tornado hit not long after. “It was just really, really loud, and as soon as it came, it was gone,” Emily Bowman said. Afterward, the Bowmans came outside to see all of the damage the storm had left behind. Two massive trees that once stood in the yard had been felled by the force of the winds, and it wasn’t until later they discovered a tree limb had pierced the roof and invaded their master bedroom. “We’re very thankful that this happened during the day when all of us were awake and able to get down as fast as we could,” Emily Bowman said. Brad Bowman expressed his disbelief at how quickly the tornado came and went. Still, as is often the case after something like this happens, the family was relieved no one was hurt. Brad Bowman’s father, Benny, said he got a call from his son just after the tornado and immediately raced to the house to see what happened. “I didn’t know how bad or if anybody was hurt,” Benny Bowman said. “All I could think of on the way out here was, ’Is everybody OK?’ All this kind of stuff can be replaced." The Bowmans’ neighbors along Plymouth Springmill Road spent Monday dealing with damage, too, from collapsed walls to roofs missing shingles. As neighbors focused on cleaning up and communicating with insurance companies, many of them got a nice surprise around lunchtime. “Howdy,” Benny Bowman greeted the man who parked at the bottom of his son’s driveway. Pheils handed out slices of pizza in hopes of brightening what could be a difficult day for these neighbors. The idea, he said, came from an employee who, like Pheils, lives nearby. The employee asked Pheils if his Pizza Hut in Ontario could donate some pizza to the people without power along Plymouth Springmill Road and the volunteers helping them out. Despite what happened to their property, the Bowmans are grateful the experience wasn’t worse.